Many parents may feel that teaching coding to younger children may be too complex, or may be worried about their screen time. But with these unplugged activities, anyone can learn the concept of coding easily without using a computer at all! What is coding and computer programming? Coding is a set of instructions written by a programmer, that the computer carries out. Sequential activities help children learn different aspects of computer coding. This game teaches children about algorithms, which is a group of instructions written by the programmer to tell the computer what to do. They will also learn the concept of debugging, which is how to fix a problem in a program. 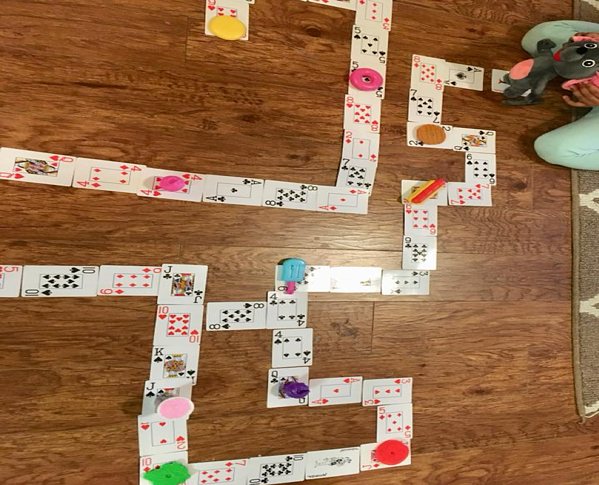 In this game, teachers and parents can design a path for the mouse using a deck of card and place some yummy treats for him throughout the path. The objective of the game is to move the mouse through the path without missing any treats on its way. One child acts as the Computer (who moves the mouse by listening to the programmer’s instructions ). 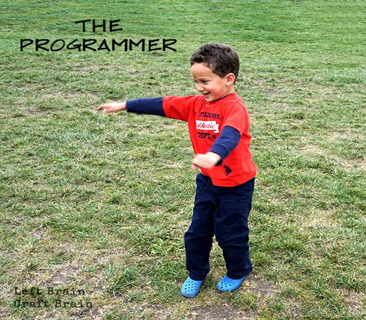 The other child acts as the Programmer (who gives the commands). The Programmer gives verbal instructions like 'Move Forward' (state how many card spaces), 'Move Backward' (state how many card spaces), and 'Turn Right' or 'Turn Left' to guide the computer/mouse throughout the path, without missing any of the yummy treats. The challenge level of the game can be increased by creating a more complex maze and putting obstacles in pathways that the mouse has to escape from or maneuver around. This activity introduces the binary system, which is the language that computers understand, to anyone who can count. A set of cards with 1, 2, 4, 8 and 16 dots. Visit CS Unplugged for printable cards. There’s also more in-depth instructions and additional activities to try out! Step 1: Cut out the cards on your sheet and lay them out with the 16-dot card on the left. Make sure the cards are placed in exactly the same order. Step 2: Now flip the cards so exactly 5 dots show—keep your cards in the same order! So, the binary number for 5 is 00101 or 101. When a binary number card is not showing, it is represented by a zero. When it is showing, it is represented by a one. This is the binary number system. So the binary number for 11 is 01011 or 1011. Step 3: Find out how to get 4, 10, 12. Is there more than one way to get any number? What is the biggest number you can make? What is the smallest? Is there any number you can’t make between the smallest and biggest numbers? This activity introduces children to the conditional statements (If/Then Statements). A conditional statement tells the computer to execute a set of action depending on a specific event. The objective of the game is to follow the programmer’s instructions and perform a particular task . 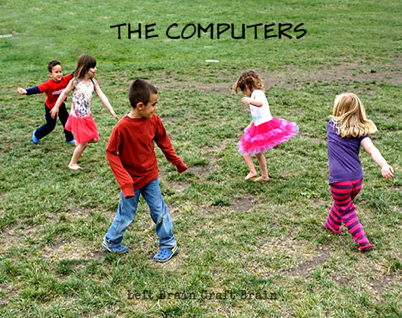 For every round, one child is the Programmer and everyone else are the Computers. The Programmer stands in front of the Computers and gives them commands: "If I ____ (fill in the blank), Then you _____ (fill in the blank)." For example, the Programmer gave the command "If I turn in a circle, Then you turn in a circle." Or he can give challenging instructions like "If I touch my nose, Then you touch your legs." This Game can be played in different sets of rounds, such as three rounds per child. Everyone can be a programmer during their turn. This activity is a "hacked" version of the previous activity. Hacking is another concept used in computer science. It means modifying or altering the system. With a few changes to the "If/Then Backyard Game," we can design another exciting unplugged coding game. 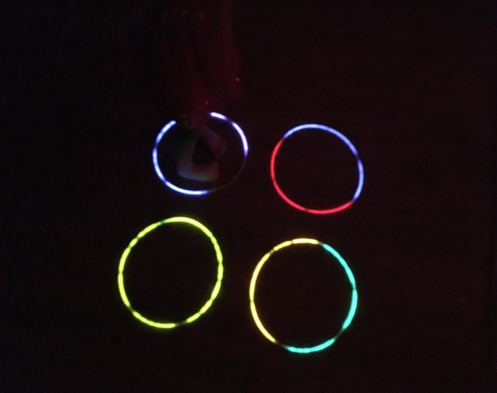 Step 1: Spread the glow in the dark necklaces in a dark room, in any fashion (grids or circles). Step 2: One Child acts as the Programmer and other children act as the computers. Step 3: The programmer will give certain instructions (events) that will cause the computers perform specific actions. Example: If the programmer says blue then the computers run to the blue rings. The difficulty level of the game can be increased by giving instructions like If the programmer says blue Then the computers run to the green rings. You can also add unrelated events to the game. Like If the Programmer taps his feet once Then the Computers will run to the blue rings. For two taps run to the green rings and so on. With a group of kids, you can add an elimination challenge to this game. If the commands aren’t followed correctly Then the Computers will have a 'bug' and can be eliminated from the game. The last computer standing wins! 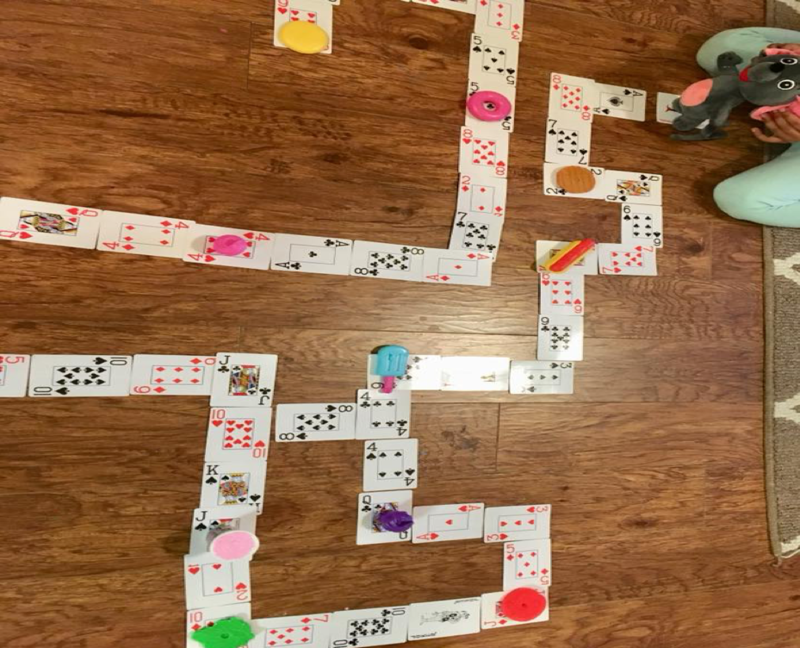 This unplugged activity teaches children two very basic concepts of coding: algorithm and sequence. An algorithm refers to a set of step by step instructions for performing a task. A sequence refers to the order of steps in an algorithm. The objective of this game is to build a lego figure (robot) correctly while only listening to the Programmer’s verbal instructions. Step 1: Build a Lego figure using the lego bricks. Step2: Make the two kids sit opposite to each other on two ends of the desk. Place the partition wall or the cardboard piece in the middle of the desk. Give the completed Lego figure to one child (the Programmer) but make sure that the other child (the Computer) doesn't see it. Step 4: Then ask the Programmer to give one instruction at a time to the Computer to build his robot. Step 5: The job of the computer is to build his robot without seeing the model and only listening to the Programmer’s instructions. If they are unable to recreate the Lego robot with the given instructions, they will realize that there is something wrong with the instructions and need to go back and check them again. This is a key concept of coding called debugging. The difficulty level of this game can be increased by giving the Computer more than the desired Lego pieces. The computer has to choose only the desired pieces and reject the undesired pieces according to the Programmer’s instructions. Another big concept of coding is abstract thinking and using symbols to represent specific actions or instruction. This activity helps children to grasp this crucial idea. 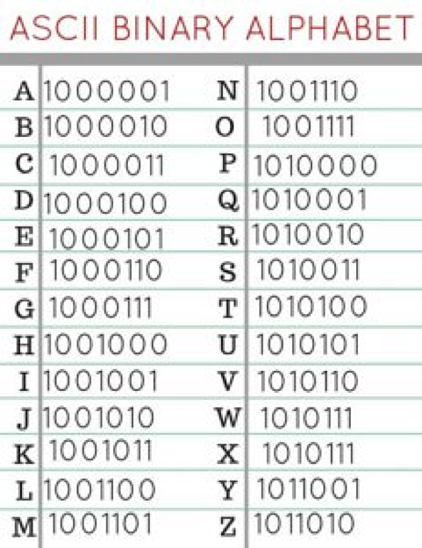 Assign each letter or number an alternative value; you can use Morse Code, Binary Code, or your own symbols. Make the code as easy or difficult as you'd like. Once you’ve created your code, it’s time for some fun. Leave each other secret messages, or hide a present and leave directions in your code and send your friends or family on a treasure hunt. Unplugged activities allow children to participate in kinesthetic opportunities that help them relate the concepts they are learning in their own lives. You can learn more about Hour of Code, unplugged activities, and its events taking place near you at HourOfCode.com. Nupur Biswal is the mom of two beautiful daughters, a wife, and a self proclaimed super nerd. 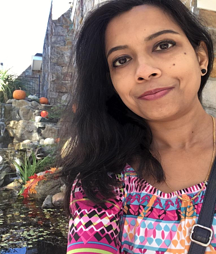 With a background in Electronics and Telecommunication Engineering and computer science, she is passionate about teaching her children coding and also sharing her love for STEM education with others. She organizes STEM activities at her local library during holidays and also conducts STEM clubs as part of her daughter’s after school activities. 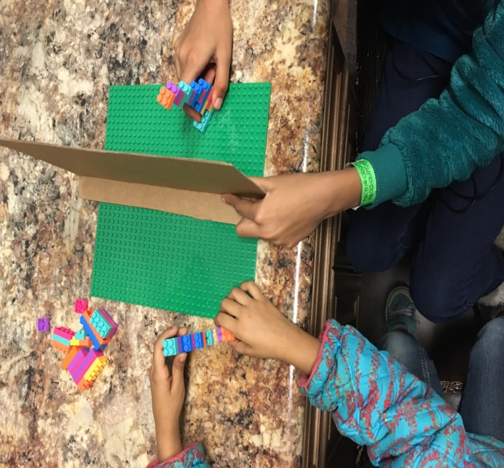 You can follow her on Instagram @nupurbiswal and her personal blog on Facebook, “Love My Game,” where her regularly shares her children’s STEM activities with other parents and teachers.